I love the chance to make baby gifts, and its even more fun when the person you are making a gift for LOVES color. 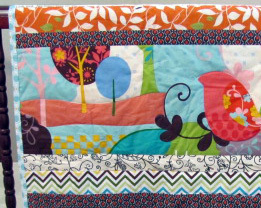 This is a simple strip quilt, I made strips the width of the fabric by 2,3,or 5. It sews up fast. 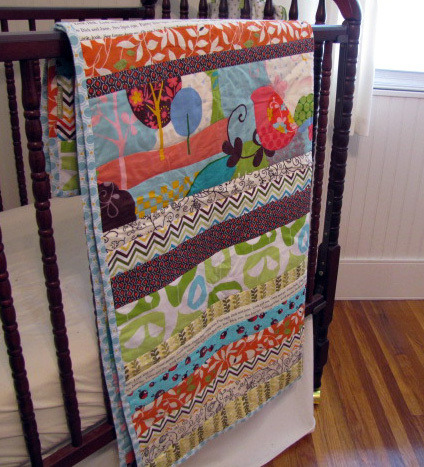 I bound the quilt with Joel Dewberry Modern Meadow Acorn Chain in Pond, love this fabric, it goes with so many prints. One of those complimentary fabrics you can never have enough of. Wow! That's really nice. I haven't seen you in awhile. It's good to see that you are keeping yourself busy.